HOW (AND WHY) SQUARE WATERMELONS ARE MADE - What About Watermelon? Let’s get one thing out of the way right up front: It doesn’t matter what shape the watermelon is, it’s what’s inside that matters. That said, you have to admit there’s something cool about watermelons that defy convention by assuming different shapes. Last month, I talked about Japanese farmers who had figured out a way to grow heart-shaped watermelons. Of course, the precursor to those sweethearts are the unusual square watermelons that got their start in Japan almost a decade ago. But how are they grown, and why bother tampering with Mother Nature? Both are good questions. I’m glad I asked them. First, the how. 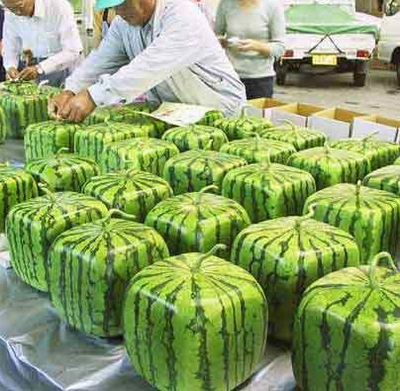 It’s actually pretty easy (relatively speaking) to grow a square watermelon. Just about anyone can do it. While the watermelon is still small on the vine, a square, tempered glass box is placed around it. When the watermelon gets bigger, it assumes the shape of the box! You can do this too. There are even websites dedicated to teaching you how. Just remember to use a glass or transparent mold so the sunlight can reach the watermelon on all sides (except the bottom, I guess). How cool is that:) Thanks for sharing, Watermelon guy!!! My pleasure Louise. Meanwhile, I’m at home working on my super secret plan to create watermelons in the shape of small woodland creatures. It’s not going well. On the morning news they ran a clip on growing square watermelons in Japan. They are unusual, but the clip said they were not only expensive but they were not for consumption. So why then? for display is what they said. They didn’t elaborate, I’m assuming for carving purposes maybe, like ice sculptures? One would think that with space so tight in Japan and land so expensive they would put their ingenuity to better use, like growing food for the masses, food that their people could eat and afford. But so much of what we humans do make no sense anyway, so why not watermelons. That then leads to the question, Why did the watermelon tumble across the road? To get to the other side! Of course, who didn’t know that? They are actually NOT edible, as they are harvested when they fill the cube (or heart, or whatever) instead of when they are ripe. So they are harvested early for ornamental purposes only as if they keep growing to ripeness they would split or rot. Thanks for the link Chad! Check us out if you’d like to try making one of these! I should point out that the price tag of these squared watermelon is anything but “a small price to pay”… they go for about 200.00US$ in Japan (yes, you read it well, 200 DOLLARS! ), and there’s no reason why I shouldn’t stick with my 2-Euros, 3-Kilograms watermelon, fully natural and well ripe, here in Italy. like chad said…you cannot eat them! Anyone who spends 60 or more dollars for something you cannot eat is insane! If you want to throw your money away, send it my way! 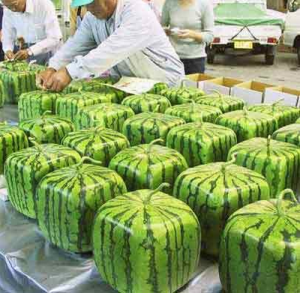 how we can produce square watermelons. just have less offspring and enjoy a bigger refrigerator. Actually, it’s not the amount of kids, it’s the death average, people are living longer than they did back then, which is why the population is increasing.